Week 4 of our 2016 Season is the very different Mayfair Saturday. Vehicles cannot be driven into or parked on Irvin Avenue, which is narrower than our usual spaces. Instead, you’ll be parking in the lot behind the Kitchen Associates building and unloading by foot onto Irvin Avenue. 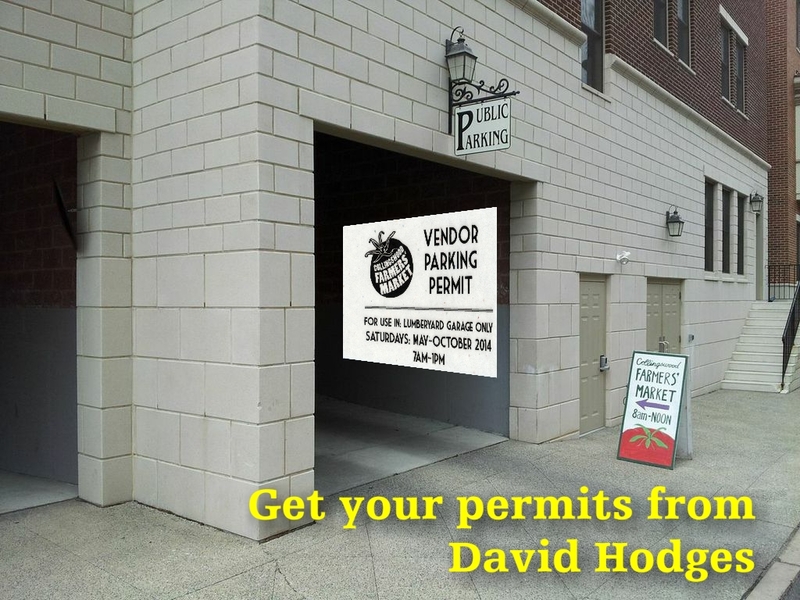 A few vendors have made appointments with David to arrive at particular times for very brief vehicle access. Unless you have a scheduled time to use your vehicle, park in the Kitchen Associates lot and walk your setup. Mike DiBartolo will attend with his groaning tables of baked goods. Villa Barone will set up a table too. Sara’s Produce will join them both near the intersection of Haddon Avenue. They will be the only representatives of our BID contingent this week. There will be no Veggie Valet or dedicated Nonprofits spaces (and no Dog Tent) this week. All will return SAT JUN 04. This week especially I will need vendors to be flexible and understanding as you set up your spaces. I will be on the site from 6am until 8am to facilitate the load-in, after which I will depart to visit the West Windsor Farmers’ Market near Princeton. (It’s the only Saturday I am free to see this Market, and I’ve never been there.) Remain calm and sell a lot of stuff. Revised weather forecast for Saturday. Rain in the forecast, but not during setup. Once we open, the chance of showers increases. Total rain forecast for the entire day: 1/4 of an inch. If you’ve been following our facebook page, or seen the News Updates coming from our Website, you know our new bloggers have been hard at work writing timely stories about events and fresh products. This week, we have new stories (and photos! and recipes!) from Christine Clarke (The Coveted Kitchen); from Susan Mauer Lynch (Yellow Room Upstairs); from Ryan Cochrane (IMadeAFood); and from Patricia DiJulio (SOUTHJERSEYGIRLGRUB). In all, there are SIX official Market Bloggers. Official Market Bloggers have been provided with credentials that look like these. Strawberry, Radish Salad. Christine Clarke (The Coveted Kitchen). This is a great time for fresh spring greens and radishes. You simply have to try this spring green salad with strawberries, roasted radishes, peanuts, and avocado in a mandarin soy dressing. Yes, there are greens, strawberries, and radishes at the Market this week. LINK HERE. Strawberry Muffins (with Chocolate Surprise). Susan Mauer Lynch (Yellow Room Upstairs) uses fresh local strawberries to make these fruity muffins with a surprising center attraction. LINK HERE. Collard Greens (the one next to the kale!). Ryan Cochrane (IMadeAFood). Ryan utilizes these treasured (by some) but less popular (for many) leafy greens. They’re available now, and when you see what he’s done with them, you’ll want to lay in a healthy supply. (See what I did there?) LINK HERE. Give Me a Root! Patricia DiJulio (SOUTHJERSEYGIRLSGRUB) purchased beets, radishes, and broccoli rabe on her Market visit SAT MAY 14. She used them all to produce this week’s blog post honoring root vegetables. LINK HERE. The stories are intended to showcase your farm and your products. CHARLIE’S CREPES takes a familiar space alongside DanLynn Organic Farm. MECHA CHOCOLATE sets up near Cheese, Etc. in the BID area of the Market. GARDEN STATE JUICE COMPANY is here with juices squeezed from the produce they bought last week here at the Market. BIANCA DEL MARE returns for the third week with soaps and skin care products. ORIGIN ALMOND (ALMOND MILK) and FRUITS D’HERITAGE round out the roster of Guest Vendors. Brand new vendor HERCULES BEARD brings aggressively organic and natural men’s grooming, beard, and hair products to the Market. BETSY COOK NATIONAL PICNIC. 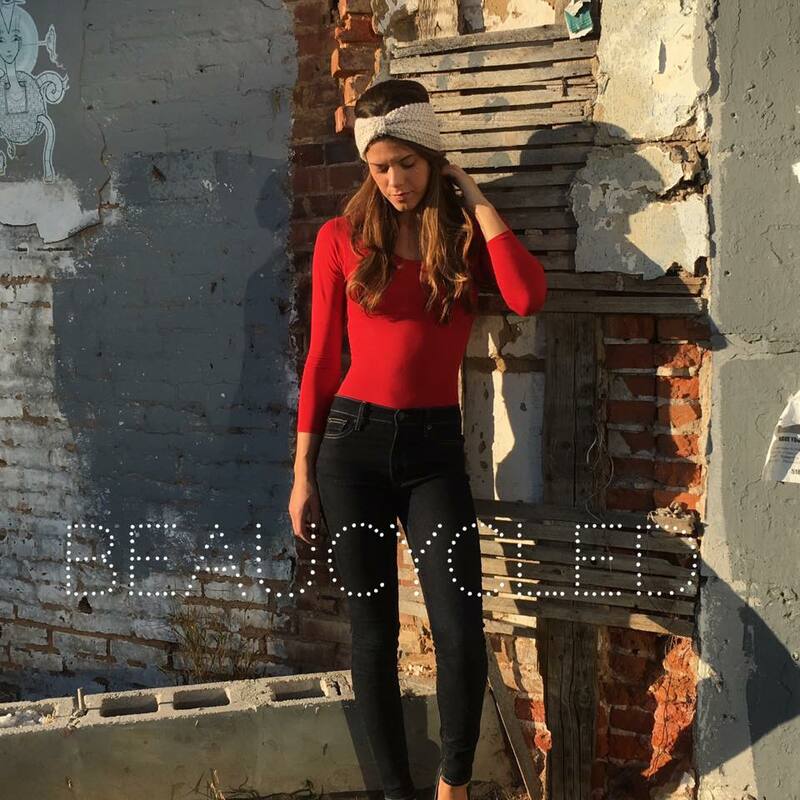 Small batch designer-make clothing from the former Director of our own beloved Market, Betsy Cook. National Picnic women’s casual clothing is sewn locally right in Collingswood. Designer Betsy Cook seeks out sustainable attributes such as organic fabrics, textiles that are milled nearby, and industry surplus, when creating her few-of-a-kind pieces. (Like her clothes, Betsy too is few-of-a-kind. Reacquaint yourself with her this week!) Facebook. CAMDEN COUNTY ANIMAL SHELTER will staff the Dog Tent for us this week, to provide Market Permit Leashes to pet owners who haven’t yet legitimized their dogs. Already on Opening Day, we noticed a significant decline in the number of disposable, single-use plastic bags at the Market. We’re taking a variety of steps to help shoppers eliminate them where possible. Perennial favorites DiBartolo Bakery, Villa Barone, Cheese Etc., and Sara’s Produce will be selling food. Collingswood Music will attend to promote instrument sales, vinyl products, and music lessons. This won’t be easy, but it’s necessary. 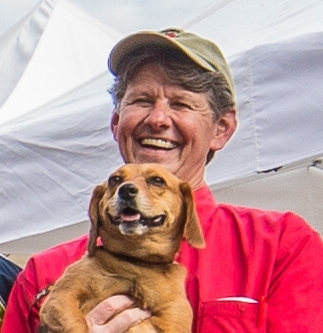 If good dog behavior is important to you, you’ll comply in with the No Permit, No Purchase policy, declining to serve customers who don’t choose to cooperate with the Permitting and Behavior Guidelines. 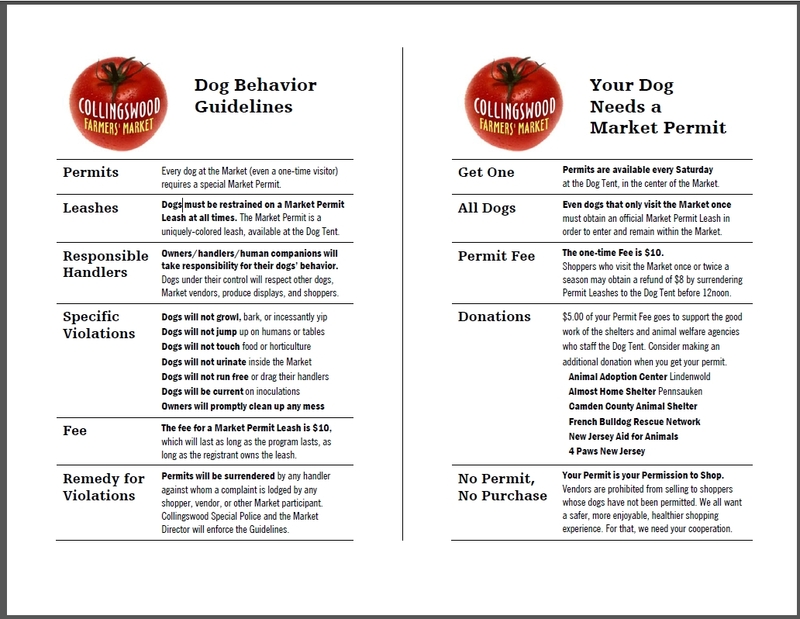 David will distribute a batch of Dog Behavior Guidelines to all vendors for distribution to anyone who appears at your table attempting to make purchases with a non-permitted dog. Honestly, have you ever seen anything prettier than that long column of SUNNY!? At last, the weather we deserve (and that the strawberries and peas need). Please note, however, the INCREASING WINDINESS toward noon. Don’t forget your tent weights. Susan Mauer Lynch (Yellow Room Upstairs) and Denine Gorniak (The Bicycle-Chef), have both posted stories already, and we’ve linked to them all. Donna Hutchinson has contributed a nice story about Quick Fresh Pea Ravioli. In all, there are SIX official Market Bloggers. The stories are intended to showcase your farm and your products. Les Viereck has been the beneficiary of stories about asparagus and peas, and other vendors, including Hillacres Pride, Weckerly’s Ice Cream, and Origin Almond, have already received mentions in blog posts. However WOODS EDGE FARM (alpaca wool goods, honey, beeswax) has moved to an unaccustomed spot to make room for . . .
NATURE’S OWN FARM FREE RANGE EGGS, who needs to be near the electric box to run the cold box on their pickup truck. Guest Artist Sultana Aschim makes flower crowns, handmade jewelry with stones and found objects, collaged windows, mysterious items. Sound eclectic? You bet. Stop by and see what else she forgot to mention this time. Link to her etsy page. ALMOST HOME ANIMAL SHELTER will staff the Dog Tent for us this week, to provide Market Permit Leashes to pet owners who haven’t yet legitimized their dogs.